PAX Available Classes and Skills! The classes chosen by the Devs to be used at PAX are an example of the trinity system Intrepid aim for in AoC. 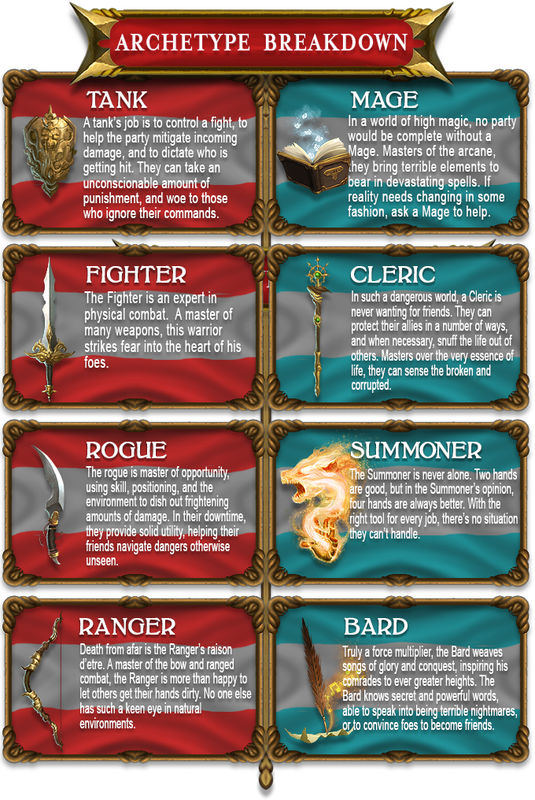 They have also given skills that allow you to immediately play the game, that are an examples of what the class represents and works well in combination of other classes. Therefore you will not see things like the Skill Trees but you will see a “pretty solid kit” that will allow you to have quite a bit of fun during a small session of PAX Gameplay. 1 KEYSTROKE SKILL: A keystroke time frame combat system that activates based off your weapon use. Every player will have a weapon which generates keystroke energy. The weapon will influence the total damage you do, other conditions and stats associated with weapon type. One of the most integral parts of having a weapon is your WEAPON USE ABILITY and that weapon use ability contains within it a keystroke driven/ precision type combat that then allocates energy to the ability to use a certain ultimate skill that your class is going to have.These are to take place of a boring auto attacks. You do not have to do keystrokes - you can just auto the attack but the keystroke allows you to generate energy for an ultimate skill. 1 ULTIMATE SKILL: Special skill determined by weapon type that can be activated by enough energy accumulated from KEYSTROKE. Skills will be “enough time” so when used strategically can “turn the tide” and be game changing. 1 UTILITY SKILL: Each class has a utility skill that isn’t necessarily dependent on a combat situation. Utility skills grant the player the ability to interact with their environment and hazards that may exist within that environment. A unique way to gather information about the world that another player may not be able to do. Utility skills are NOT spammable so will need to be strategically used because they will have cool-downs. The TANK at PAX will be a sword and shield wielding TANK. No SECONDARY ARCHETYPE. TAUNT: Traditional draw aggro from a target skill. This ability can be used sometimes on a single target, or in a directional column or as an AoE around the player allowing the tank to control what threats are being distributed to their party members. PULL/LASSO: “Get over here! * To pull a target towards you to gain control of positioning. SHIELD BASH: Staple sword and shield tank skill. Shield bash will be a damage dealing skill with additional effects stun/CC or perhaps another knock to the ground. SHIELD AID: *Puts that shield up into the sky - he lets his Gods know that “Hey this party is mine!” - A percentage of damage that party members are taking gets shunted back to Tank. Party members will need to be within a proximity of the shield to be protected. KEYSTROKE (SWORD AND SHIELD WEAPON): A slash from sword that comes down and as he maintains parity with the combatant of distance ~he is going to have the opportunity to keystroke within a certain window of time during the animation effect to slash target, which will then allow another keystroke combo effect that he will then hit the target with his shield and then another keystroke combo opportunity that will allow (if hit at the right time) to do a final hit with the sword. TANK ULTIMATE (SUPERHERO JUMP): * Tank Jumps up in the air and slams down “like a superhero” and does a big lasso for all the targets around as a massive battle field control. Can be activated after enough energy generation from procs from KEYSTROKE skill. TANK UTILITY: A perception changer - a threat detection : Tank will determine an area to some degree of distance beyond which is normal for him to interact with and determine what actors are present there that may provide threat to the party. Not just a backrow healer. Intrepid don’t want healers to be a one dimensional healer. The CLERIC and PAX will be a STAFF WIELDING CLERIC - which means up front and personal with any enemies present. *Please remember that not all CLERICS will play this style - it will be dependent on what you choose as your weapon, your skill tree, your secondary archetype etc. TARGETED SPOT HEAL : An ability to take a TARGET PARTY MEMBER and heal them up but in addition to that healing effect - it adds a HoT that will act as both a heal for the target and a proximity based DoT for any near by enemies. LIFE BALANCE SKILL : An AOE template that the cleric will lay down on the battlefield and enemies within that template will suffer damage and have life removed and transferred to allies within that template. GROUP BALANCE LIFE FORCE : Allows the cleric to take the health percentages of the party and balance them to an equal metric for all party members. CHAIN HEAL EFFECT SKILL : Target a party member and launch a line of heals towards them that will then arc based on proximity to other allies that can continue to jump from ally to ally. The more times this heal effect jumps will also deal burst damage to nearby enemies within proximity of the target. With every stack of heal that jumps to an ally it will deal additional damage to the enemy. If target is dead : A longer cast skill. KEYSTROKE : Precision window keystroke unique to weapon type. Not detailed in stream. CLERIC ULTIMATE : A Divine form *cleric rises from the floor floating there all awesome like* Grants Party members that are within proximity of the cleric, as well as the cleric themselves, a HoT and increases the amount of heals the cleric will do as well as their damage output during this period of time. Will give the DoT proximity to each party members - so damage is dealt in proximity of each party member. CLERICS UTILITY: Environmental cleansing. A purge e.g cleanses a curse in an area of a dungeon cursed by an evil mage. MAGE at PAX will be a SPELLBOOK wielding mage. The spellbook will allow the mage to draw energy from ARCANE magic and do damage at RANGE. FIREBALL *gasp* : Fast cast targeted spell that deals splash damage in an AOE template. Mage chooses a point of impact for this fireball. (might not see at PAX but has the potential to light targets on fire and have certain conditions - and maybe environmental influences too). LIGHTNING BOLT: A line template of an attack that involves the mage determining the direction of the bolt and striking targets and dealing damage within that line. SELF TELEPORT: Allows the mage some mobility. Mage will teleport depending on direction facing. KEYSTROKE: Precision window keystroke unique to weapon type. Not detailed in stream. MAGE ULTIMATE: Earth Eruption - A huge AoE earthquake that is going to be a line template of an attack that is casting forward from the direction of the mage is facing that is going to trip opponents and deal damage when it impacts targets. Will be a broad line template as the skill is supposed to be “devastating to enemy targets”. MAGE UTILITY: Detect magic - Be able to see magically hidden points of interest in their local area e.g an illusion wall that is hiding a secret passageway. RANGER at PAX is a BOW WIELDING ranger. Rangers will have a minimum distance from target in order to use bow. POWERSHOT: A charge up bow attack. Longer you hold the shot - the more damage dealt. (It is being discussed if the attack will penetrate through a target and carry on hitting further targets). SNARE: A foot-pin shot to slow target down. MARK TARGET: Markshot debuffs the target so that the target takes additional damage from ANY OTHER source of incoming damage. Will put effects on the target so that other party members can see that the target is under the effect of the debuff. DASH ABILITY: To pull the ranger out of a precarious situation. Ranger will be able to use a follow up shot once activated a dash. KEYSTROKE: Launches a primary shot that leads into a (maybe) a two arrow shot and into some kind of arcane shot. RANGER ULTIMATE: A rain of arrows. Lay down a template out in the battlefield and then going to cast up the shots into the air and rain down on the template zone. RANGER UTILITY: Tracker skill to see hidden physical things e.g creature/payer leaving behind footprints.